Melrose maintained their recent momentum by winning the clash of the big guns at the Greenyards with a performance that owed as much to their mauling technique as to their exemplary discipline. Two of the Melrose tries came from driven lineouts while in terms of yellow cards the Greenyards men were squeaky clean. In contrast Ayr fell foul of rugby’s laws, flanker Will Bordill twice shown the yellow card and Ross Curle providing the back row with company in the sin-bin for the last five minutes. The match, as expected, was a bruising affair that for much of the match had tension laced through it with a capital T, the physicality amplified by the inclusion of several professional players in both sides, among whom Adam Ashe and Lewis Carmichael made big contributions. Melrose, moreover, never ducked out in the tackle. “I thought their goal line D was excellent. They never gave an inch,” conceded the Ayr coach, Calum Forrester. Stand-off Craig Jackson, who showed coolness under pressure, was outstanding for Melrose and must surely have advanced his case for inclusion in the Scotland Club XV. Alongside him, centre George Taylor made several cutting breaks, complementing his offensive play with rigid defence. 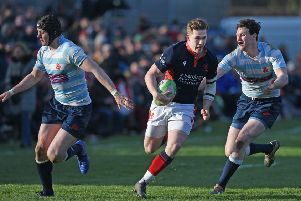 For Ayr, Curle demonstrated his natural appetite for the attacking game, as scrum-half David Armstrong kept the Melrose defence busy. The game was only seven minutes old when Bordill collected the first of his two yellow cards for a late tackle on Jackson. But Melrose were unable to make their numerical advantage count despite Jackson creating a three-on-one which his outside backs fluffed. Having withstood Melrose pressure, Ayr claimed the game’s first points with a Curle penalty, the advantage almost immediately cancelled out by Jackson. The game then burst into action when Fraser Thomson of Melrose ran a penalty from near his own line. Jackson cleverly put Taylor into the clear before, with more than a hint of a forward pass, Austin Lockington was sent in for a try, converted by Jackson. A second penalty goal by Jackson after the break increased the Melrose lead but after a long siege on the home side’s line, Ayr finished with a try from skipper Pete McCallum converted by Curle. Then after Bordill converted yellow into red, Russell Anderson was driven over, Jackson converting for a 20-10 lead. And it became worse for Ayr as Curle was sin-binned for a no-arms tackle. Again the Melrose forward machine drove over, this time replacement Ruairi McLeod being the scorer. Jackson converted from wide out to complete a consummate performance.